A slab leak in Texas is about as common as cowboy hats and Tex-Mex. Due to soil and climate, Texas is one of the leading states in home foundation issues. Since a lot of your plumbing is laid within your foundation, it’s easy to see why foundation or slab leaks are a real concern in North Texas. At Elite Plumbing, we understand the severity of a slab leak. That is why we offer qualified plumbers who can evaluate and identify a problem as well as architect the solution to the issue. Slab leaks have the potential to cause major damage that total in thousands of dollars of repairs. The goal at Elite Plumbing is to fix the issue before it gets to that point. While discovering a slab leak can be hard to the untrained homeowner, there are a few things you can be on the lookout for. Pooling Water is a good indication that there is a slab leak. This could be inside of your home, normally close to a plumbing pipe or fixture (like the washer, refrigerator, or toilet). If you walk into a room and find a small puddle of standing water that shouldn’t be there, it’s a sign that you may have a problem in the foundation. This can also happen outside. If you happen to see water pooling near your foundation, it’s likely that there is a leak from one of the pipes that is feeding back out from the slab to the side of the home. 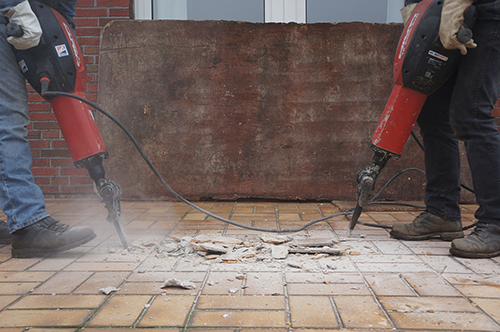 It is also common to notice a distinct sound if you have a slab leak. It will normally sound like water rushing, but it will be clear and sound like it’s coming from under your floor. If you think something sounds out of the ordinary, it would be best to turn off all of the water to your home. You can do this by turning off each of the plumbing fixtures individually or, if you can access the main water supply, you can turn off all the water at the same time. Once the water or fixtures are turned off, continue to listen. You should not hear any water running at this point. If you do, then there is clearly an issue. Finally, as with most plumbing issues, watch your water bill. The water bill will always fluctuate with the water used in a month, however it should normally stay within a pretty standard range. If you notice your bill growing or hitting a spike, it’s likely there is a leak. If that leak is not visible or easy to find, there is a chance it’s a slab leak. At Elite Plumbing we take slab leaks very serious. If you believe you might have a slab leak please call us immediately. We can schedule an evaluation and help you solve the issue before it grows out of control.